It was a perfect season for the Leone High Junior Varsity basketball Lions. 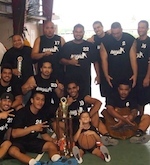 Perfect enough, 8-0, to be crowned the 2004 ASHSAA Boys JV Champions. The younger Lions lacked height and size in the paint. They didn't even have a wide-body forward or center that was hefty enough to dominate the low post. However, they still defeated teams with their exceptional speed and great passing. "We didn't have huge players that could control the low-post, then I implemented a zone offense to capitalize on their quickness," said coach Tony Aetonu Jr. The JV Lions fell behind in the last quarter in most of their games, but their composure and consistency lifted them to triumph. "These kids are very easy to coach, and very talented basketball players," said Aetonu. During one game, the Lions were down by 10 points with not much remaining in the final period. Coach Aetonu saw the look of despair in the eyes of his jayvee team and gave that much needed pep talk to his players to be honest. "I told them that if you do not feel you should be on the court right now, tell me and I will fix that in a hurry," recalled the Leone JV coach. "Then three of our starters surprised me by raising their hands and one of them told me, "Coach, bring in somebody else I need to be replaced because I just don't feel my touch today." With 2:15 time left on the game clock, Coach Tony Aetonu, put in four guards and a forward and launched a massive full-court press defense that forced turnovers on a 15-2 run, including 13 unanswered points, much to the delight of the three replaced starters watching from the bench. "That's one of the principles of forming a good team, as I told these kids, 'It doesn't matter how good you are, it's a proven fact, every player has his good and bad days," said Coach Aetonu. "Team sports is played together with everybody contributing, if there are 5 on the court, than we expect a 500% effort or more to win games." The junior varsity division doesn't have a playoff format like the varsity boys. The title is determined by best record in the two round season. Head Coach Tony Aetonu expresses his gratitude to the parents, school faculty and fans for their support. Leone High Lions 2004 Junior Varsity team; Nicholas Peters, Raymond Tuigamala, Ryan Tuigamala, Livi Ta'alili, William Steffany, Kamilo Ah Ching, Fetu Ioasa, Solomona Aigamaua, Simati Ofagalilo, Henry Afalava, Stanley Ta'ase. With Leone JV winning the championship, the young Lions now turn their sights and support to the older Lions are in the hunt for the varsity title. Playoff starts against Fagaitua. A win will put them in the finals against reigning champs Samoana.